Ladakh, the Land of High Passes, wins hearts with its simplicity and rugged natural beauty. Spectacular landscapes, enfolded by serrated mountains, give the region its unique character. Largely influenced by Buddhism, Ladakh is home to numerous ornate monasteries. The pristine natural heritage of this fabled realm can be seen in its picturesque lakes, unspoilt by human civilisation. Showcasing an exotic character and cloaked in a transcendental aura, Ladakh is a destination, which is gaining immense popularity among globetrotters. Ladakh tour packages are opportunities that would take you to see a world, so serene and picture-perfect, that it would seem like a dreamland. Reaching Ladakh can be a little tricky due to the undulating quality of its terrain; however, it is accessible by various means of transport. The main airport in the region is in Leh, its largest city. Ladakh has been bestowed with an abundance of natural wonders. 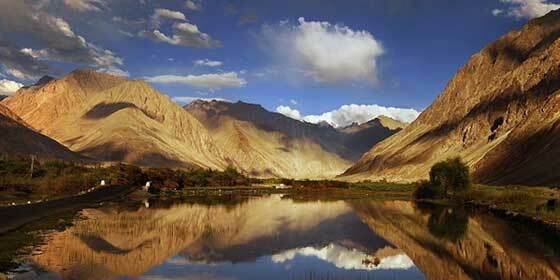 Located in the north-eastern part of Ladakh, the Nubra Valley matches the ideals of scenic beauty. While availing Ladakh tour packages, keep in mind they take you to some of the top tourist attractions like Hemis Monastery, Thiskey Monastery, Tso Moriri lake and Pangong Tso lake. If you are an adventure seeker, a trekking trip to the Zanskar Range should be in order. Ladakh also offers marvellous shopping opportunities for Tibetan handicrafts, available in its vibrant markets. Snow leopards, Tibetan hares and yak are some of the animals that can be spotted here. The snow-capped mountains and welcoming seclusion of this enchanting region render it an ideal honeymoon destination. After breakfast drive to Alchi Monastery (70kms) is the most famous and oldest of all Gonpas built in around 11th century by Lotsava Rinchen Zangpo (the great translator). Likir Monastery (55kms) founded in 1065 A.D by Lama Duwang Chosje belongs to Gelugpa order, on the way visit Hall of Fame (war museum), Spituk Monastery (7kms) founded by Od- Lde in 11 th century A.D and was named by Lotsava Rinchen Zangpo (the great translator), Pathar Sahib (Gurudwara), Magnetic Hill and Sangam (35kms) confluence of river Indus and Zangskar. Dinner and overnight at Hotel/Camp in Alchi. After breakfast drive to visit Lamayuru Monastery (125kms) built on natural pillar like composition of sandstone belonging to Drigunpa order. Drive back to Leh via same route, Dinner and overnight at Hotel in Leh. After early breakfast leave for Pangong Lake (14,500ft), 4-5 hrs drive one way through Changla Pass (17,350ft) third highest motor able road in the world. This famous blue brackish salt water lake is 5-6 kms in width and around 134 kms in length with 75 percent of its running the other side of the Indo China Border. On the way visit Shey Palace (15kms) Shey was the summer Palace of Ladakhi Kings, where you can see three storied statue of Buddha Shakyamuni, made of copper and plated with gold. Thiksay Monastery (17kms) the 12 storied Monastery of Thiksay is the principal Monastery of Gelugpa order situated in the most prominent of positions lies on an island mountain, dinner and overnight at Camp in Pangong.